Our new paper titled ” On the role of individual subunits in MscL gating: “All for one, one for all?” is accepted for publication in FASEB J (31 October 2012). The research reports that hydrophobic gating alone is not sufficient for full opening of the channel. 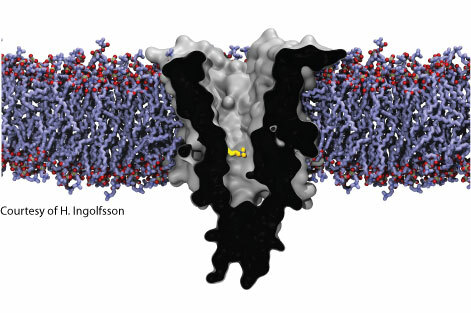 This suggests the presence of supplementary mechanisms and/or insufficient expansion of the channel by hydrophobic gating in the absence of applied tension. Congratulations to Nobina Mukherjee for winning the best talk prize in the 20th annual GBB Symposium. Congratulations to Duygu Yilmaz for winning third poster prize in the 20th annual GBB Symposium. Our new paper titled “Hydrophobic gating of mechanosensitive channel of large conductance evidenced by single-subunit resolution” has been published in Proc Natl Acad Sci USA. The research reports a method that allows single-subunit resolution for manipulating and monitoring of a homopentameric mechanosensitive channel protein. A collaborative review paper with Prof. P. Déjardin group on “nanopore sensors: from hybrid to abiotic systems” has been publisjed in Biosensors & Bioelectronics. The review focuses on synthetic treck-etch pores in polymer foils and on biological nanopores. Postdoc Martin Walko is leaving the Kocerlab where he worked for 2 years. He will be working at P. J. Safarik University in Kosice, Slovakia, as an Assist. Prof. We wish him all the best and success in his new position. Bachelor student Martijn Zwama successfully completed his bachelor thesis on “Bilayer mediated modification of MscL function by phytochemicals”. We wish him lots of success in his Master studies.